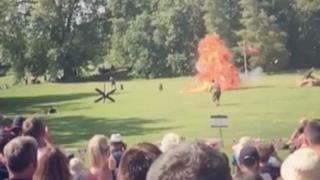 An explosion at a stately home that left two World War Two re-enactors with leg injuries was caused when a device "unexpectedly discharged", an investigation has concluded. The accident happened at Audley End House, Essex, on 28 August. English Heritage said the two men taken to hospital were "recovering well". Its report said the "final pyrotechnic unexpectedly discharged, outside of the planned sequence", but it was still investigating why that happened. A spokesman for the charity, which manages the Jacobean mansion and its gardens, said. "The display was managed by a specialist contractor who has provided displays of this nature for English Heritage for the past seven years and has an exemplary safety record. "English Heritage is commissioning an independent specialist to try to ascertain why the pyrotechnic unexpectedly discharged. "However, the investigation has concluded that no members of the public were at risk at any time."